A good soak in the tub can leave you feeling relaxed, rested, and ready for the new opportunities that the world is holding for you. 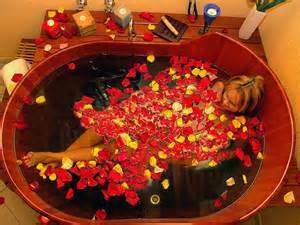 Set aside time to have a healing steep in an aromatic bath at least once a week for a health-enhancing ritual. Using essential oils in the bath is a great way to stimulate the olfactory system. The molecules of the oils are small enough to be absorbed through the skin and enter the bloodstream rapidly, and are then carried to all parts of the body. Try the following potent plant remedies. The spicy aroma of juniper helps to strengthen and fortify the spirit during times of low energy, anxiety, and emotional overload. It is detoxifying, with stimulating and antiviral effects. Avoid using juniper during pregnancy and if you suffer from kidney disease. Juniper can also cause skin irritation; be sure to use with a carrier such as oil or salts. Rosemary’s versatility allows for use in respiratory and circulatory disorders, as well as muscular and rheumatic complaints. The oil can be used through inhalation, massage, steam, or diffuser for colds and flu. It is great in the bath for arthritis and muscular pain. Avoid rosemary during pregnancy or if you suffer from epilepsy, as it may trigger seizures in some people with this condition. With its sweet woody-balsamic scent, this oil helps focus the mind and relieves anxiety, nervous tension, and stress. Avoid using cedarwood during pregnancy. A sweet, fresh, fruity fragrance that is great in the bath if you are feeling stressed and anxious. Camomile is also helpful for tension headaches, insomnia, and melancholy. Camomile is excellent for dry, sensitive, and allergic skin. Avoid using camomile during the first trimester of pregnancy. Adding salts to your bath can help your body to detoxify, decrease fluid retention, and increase circulation. Try the following salts in your next bath. When used in the bath, Epsom salts can help to remove toxins from the body, relax the nervous system and muscles, and reduce swelling of sprains and strains. Sea salts are naturally high in sodium chloride and minerals beneficial to the skin and body. They are perfect to soothe frayed nerves and remove unwanted energies that may be lingering after a bad day. Dead Sea salts are extra rich in minerals such as magnesium, potassium, and calcium chloride. After an intense workout they can help relax muscles and ease stiffness. Dead Sea salts help to balance skin moisture and decrease fluid retention, and so work well to ease itchy, dry skin. Add candles and soft music to create a truly relaxing retreat. Next articleBanish Stress For Good!